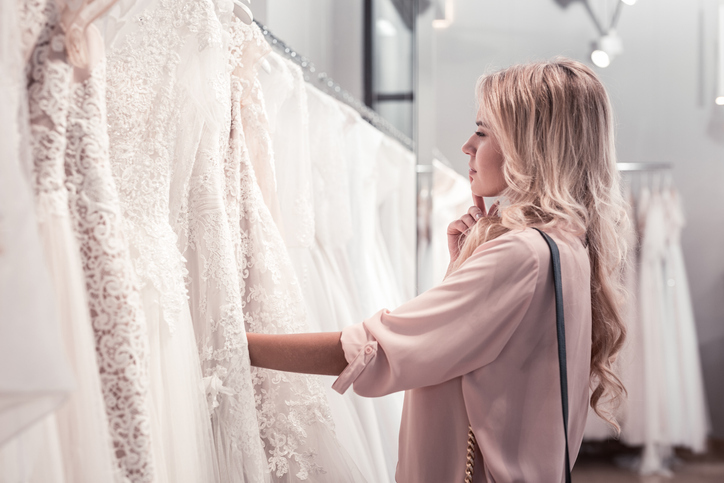 The closer you get to your wedding day, the fewer options you’ll have for where you can go shopping for your wedding dress. In bridal boutiques where you try on a sample and the dress is ordered in for you, it can take anywhere up to 6 months for your bridal gown to be delivered. If you already have 6 months or less before your big day, then an “off the peg” boutique like Townhouse Bridal is a perfect option. You get to take your wedding dress home the same day…job done! No waiting around or worrying that it won’t be delivered in time. Although this is a really easy way of shopping, you should still make sure you have time to look around. Leaving it til the last minute and being forced to choose a dress that you don’t really love is not a situation that anyone wants to find themselves in. You’ll look back on your wedding photos for years to come and will always regret not having your dream dress. Whether you order a gown or buy off the peg, don’t forget you will also need time for alterations. This is SUCH an important part of the process, as the vast majority of dresses will need some tweaking to make them fit perfectly. There’s no point in spending all that money on a beautiful bridal gown to spend the day repeatedly pulling the straps up or having to pick up the skirt to stop you tripping over. Be sure to get booked in with a reputable seamstress as soon as you find your wedding dress, or if you’re even more organised, book in with them before! Leaving it til the last minute to find they’re fully booked is stress you really don’t need. “I’d like to lose a bit of weight before the wedding”. Words that have been spoken numerous times and will be repeated by brides forever more! Of course, every bride wants to look her best on the most important day of her life, but if you’re serious about sweating for the wedding and getting the body you always wanted, then you need to bear it in mind when deciding to start the search for your dress. Losing (or gaining!) a large amount of weight can change your body shape dramatically. Start shopping before you’ve lost the weight and you may fall for a gown that no longer does you justice by the time you get to your wedding day. Leave shopping until you’ve got that killer body and you may find you’re now short on time… see above! By the way, the same applies if you’ve got a baby on the way. Pregnancy can do crazy things to your body, but hey at least you’ll have a bundle of joy to show for it. Just remind them about how their imminent arrival made planning your bridal look so much harder when they get a bit older! WARNING! Buying a wedding dress with plans to fit into it is a very dangerous game. What if it looks awful after you’ve lost the weight? Or worse, you don’t lose any weight? You’re then stuck with a dress you hate and you’re back to square one. Shop for the body you have, not the body you think you’ll have. Who, me? Yes you! What’s your personality like? Once you make a decision is there no going back, or do you change your mind at the drop of a hat? Committing to a wedding dress is almost as important as committing to your future spouse! Get it wrong and it can be stressful and expensive. If you’re likely to be swayed because you’ve spotted another wedding dress on Pinterest or have heart palpitations about a dress you can’t remember because you ordered it 2 years in advance, then maybe you need to leave shopping until a bit nearer your wedding day.